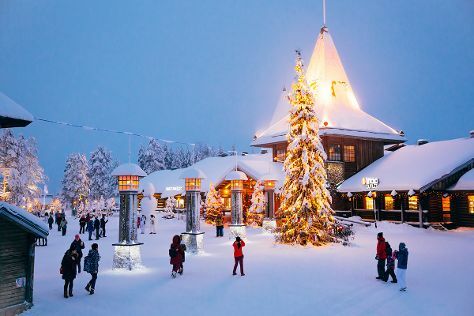 Start off your visit on the 22nd (Wed): stop by Your Piece Of Finland, then take an in-depth tour of Arktikum, then Head underground at Syvasenvaara Fell, and finally find something for the whole family at Santa Claus Village. Get ready for a full day of sightseeing on the next day: get in on the family fun at SantaPark - the Home Cavern of Santa Claus and then take an exotic tour of a safari tour. For ratings, more things to do, reviews, and other tourist information, refer to the Rovaniemi trip planner . Kuala Lumpur, Malaysia to Rovaniemi is an approximately 20.5-hour flight. You can also do a combination of bus and flight. You'll gain 6 hours traveling from Kuala Lumpur to Rovaniemi due to the time zone difference. Traveling from Kuala Lumpur in May, things will get much colder in Rovaniemi: highs are around 12°C and lows about 3°C. Finish your sightseeing early on the 23rd (Thu) to allow enough time to travel to Koli National Park. Koli National Park is known for trails, nature, museums, wildlife, and outdoors. Your plan includes some of its best attractions: head outdoors with Neitikoski Rapids, take in panoramic vistas at Rasavaara Observation tower, explore the activities along Pielinen, and look for gifts at Koli Shop Retkitupa. To find other places to visit, photos, traveler tips, and other tourist information, use the Koli National Park trip site . Traveling by car from Rovaniemi to Koli National Park takes 6.5 hours. Alternatively, you can fly. Expect a bit warmer weather when traveling from Rovaniemi in May: highs in Koli National Park hover around 16°C, while lows dip to 4°C. Finish up your sightseeing early on the 26th (Sun) so you can travel to Helsinki. Pack the 29th (Wed) with family-friendly diversions at Linnanmaki Amusement Park. And it doesn't end there: brush up on your military savvy at Sea Fortress Suomenlinna, take in the spiritual surroundings of Kamppi Chapel of Silence, don't miss a visit to Senate Square, and get to know the fascinating history of The Esplanadi Park. To see photos, ratings, more things to do, and more tourist information, read Helsinki trip planner . Explore your travel options from Koli National Park to Helsinki with the Route module. In May in Helsinki, expect temperatures between 18°C during the day and 7°C at night. Wrap up your sightseeing on the 29th (Wed) to allow time to travel back home.